Redefine how RFPs can work for you. Visit Newport Beach Inc. will send you a *$50 Nordstrom Gift Card just for submitting a qualified RFP* requiring 75 cumulative rooms or more to a Visit Newport Beach Inc. Representative. Book an event sourced through Visit Newport Beach Inc. and you’ll receive a $300 American Express* Gift Card. So think Visit Newport Beach Inc. and discover why some RFPs are more rewarding than others. *A qualified RFP consists of 75 rooms or more for a single meeting, one year history required, one gift card per program, gift card issued upon conversion to solid lead in a participating Newport Beach hotel, RFP must be sourced directly through a Visit Newport Beach representative. A maximum of 3 RFP and 3 Sourced Event gift cards will be given to any one planner per year. American Express Gift Cards are usable at locations that accept American Express Cards. Some limitations apply. Subject to complete Official Rules. Subject to change without notice. 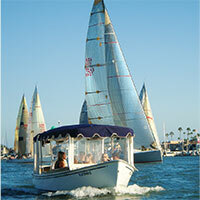 Sponsor: Visit Newport Beach, Inc., 1600 Newport Center Drive, Suite 120, Newport Beach, CA 92660.